1) This paper is a peer reviewed paper presented at the FIG Congress in Sydney, Australia in April 2010. The topic of the paper is relevant to all who are interested in high precision GNSS surveying and it is presenting a new and innovative method for antenna calibration. In relative GNSS positioning, the antenna effects are one of the accuracy limiting factors. Besides relative and absolute field calibration procedures, there is an absolute laboratory calibration procedure, which is used at the University of Bonn. Since February 2009 a new antenna calibration lab, which is especially concepted for the antenna calibration, is operable. This paper presents some investigations on the accuracy of this calibration procedure. The results are mainly based on GPS height measurements and the comparison with the results from a precise levelling. For this purpose 121 baselines between the 8 pillars of an EDM calibration baseline site with distances between 18 and 1101 meters were analysed. The levelled height differences can be regarded as references, thus it is possible to quantify the absolute GPS-accuracy. Furthermore, the GPS-accuracy is an indicator for the antenna calibration accuracy. 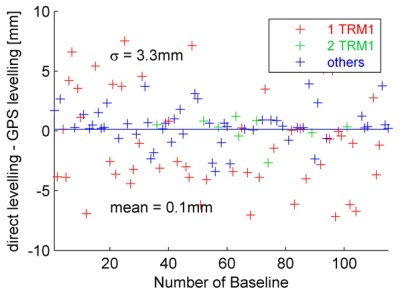 The measured height differences are usually smaller than 1-2 mm (maximal deviations), when using the L1 or the L2 frequency, thereby the standard deviation is 0.8mm in both cases. As expected, in case of the ionospheric free linear combination L0 the standard deviation rises up to 3 mm. This very high accuracy is possible if besides other effects, the antenna effects are reduced to a minimum level (e.g. the differences between an individual calibration and a type calibration can reach several mm). It is not possible to quantify the accuracy exactly, because the antenna effect is only one of various remaining uncertainties. Thus, the effects due to the calibration uncertainties are smaller than s = 0.8mm, at least. This high accuracy cannot be reached if dominant near-field effects exist. Near-field effects, which cannot be separated from the behaviour of the antenna itself, limit the accuracy of the relative GPS. Such effects are present in some of the analysed baselines, too. Here, one special antenna-near-field combination causes height differences of several millimeters. The other GPS results show an exceedingly high accuracy and give an idea of the high calibration accuracy. The phase center of the receiver antenna is the reference point where each GPS/GNSS observation (phase measurement) refers to. Since the phase measurement and, as a consequence, the determined signal path length between antenna and satellite depend on azimuth a and elevation b of the incoming signal, the antenna is not a point in mathematical sense. The purpose of the antenna calibration is to determine the deviations from an ideal point-like antenna as a function of the direction of the incoming signal (see e.g. Geiger 1988). Since the 1980’s different calibration procedures have been developed. Beside the relative and the absolute field procedures, an absolute laboratory calibration procedure exists. This procedure, which is ideally performed in anechoic chambers, is a standard technique in radio-frequency engineering (e.g. Kraus and Marhefka 2003). 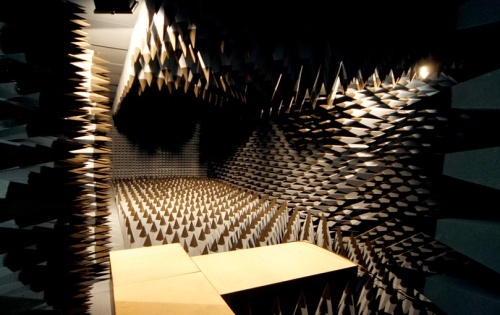 Such a laboratory procedure was developed at the University of Bonn and a new anechoic chamber is operable since February 2009. The realisation of the calibration laboratory is a cooperation between the University and the Bezirksregierung Köln (District Government of Cologne). The accuracy of the calibration results has been assessed by comparisons with the field procedures in earlier works (Zeimetz and Kuhlmann 2006 or Zeimetz et al. 2009). Additionally, the calibration results can be analysed by applying them for GPS-measurements. To avoid that other GPS uncertainties dominate the antenna effects, it is useful to make these tests in a small local GPS network. For this purpose an Electronic Distance Measurement (EDM) calibration baseline site of the Bundeswehr (German Federal Armed Forces) could be used. The differences between the GPS solutions and the precise levelling visualize in the first place the GPS accuracy and thus among others the remaining antenna effects. A remaining problem is the near-field problem. The near-field depends primarily on the mounting of the antenna (pillar/tripod, tribrach, spacer). Differences between the setup in case of calibration and in case of GPS-measurement can be reduced but not eliminated. The near-field affects mainly the height component, as it becomes visible in the tests presented here. The GNSS receiver antenna converts the electromagnetic satellite signals into electrical currents. After the conversion of the signal, the remaining path length (cable, electronic components) is similar for all satellite signals (except for small amounts), thus, the estimated GPS-position refers to the antenna or more exactly to the so called phase center. This view is only correct if the phase measurements would always refer to one fixed point. In reality, the measured phase depends on the direction (azimuth a and elevation b) of the incoming signal, thus, the so called phase center variations (PCV), which describe the deviations from a mean phase center, have to be considered. The position of the mean phase centre with respect to the antenna reference point (ARP) is usually described by the phase center offset. This classification of PCO and PCV can be found in earlier works on this topic (e.g. Geiger 1988). The corresponding antenna model is illustrated in Fig. 1. Fig. 1: Antenna model (Zeimetz and Kuhlmann 2008). 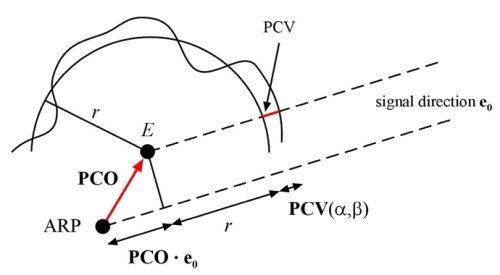 Because the PCV can reach values up to 20 mm it is always necessary to use the full antenna model (not only the PCO) if highest accuracy is required. Examples of the phase center variations are presented e.g. in Zeimetz and Kuhlmann 2006. The main idea of the laboratory antenna calibration procedure is to simulate the different signal directions by rotations of the GNSS-antenna (Schupler et al. 1994). Therefore, the calibration setup consists of a fixed transmitter on the one end and a remote-controlled positioner carrying the test antenna on the other end of the test range (Fig. 2). At every selected antenna position (equal to a satellite direction) a network analyser (NWA, here Agilent ENA E5062A) generates a signal which is transmitted in the direction of the GNSS antenna. 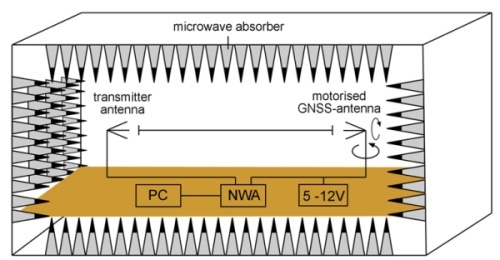 The GNSS antenna is also connected with the NWA, thus, the NWA can measure the phase shift between the outgoing and incoming signals. This phase delay depends on the signal direction. Since the outgoing signal is constant, a grid of phase corrections is directly obtained as a result of the calibration. Usually a frequency range from 1.15 to 1.65 GHz is used, whereby only the frequencies of GPS, GLONASS and GALILEO are usually analysed. Fig. 2: Setup of the anechoic calibration facility (Zeimetz and Kuhlmann 2008). Regarding GPS, multipath and near-field effects are one of the largest sources of error (e.g. Wanninger and May 2000). In case of calibration the multipath effects can be reduced to a low level by using special anechoic chambers (Fig. 3), whereas the near-field problems cannot be avoided. As in case of normal GPS applications, the nearby environment of the antenna has an influence on the electromagnetic field and thus on the phase measurement. Analyses by comparison of calibration results on the level of different phase patterns. Determining the accuracy of the calibration by GPS-measurements in GPS test sites. In order to determine the calibration accuracy, it is possible to compare the results from different independent calibration procedures (comparisons between laboratory-, relative- and absolute field calibration). This approach supplies a very clear look at the differences between two patterns, but there are two important disadvantages. (1) Only the agreement between two different antenna patterns can be tested. It is not possible to distinguish the differences between the compared antenna patterns into two parts. An absolute accuracy cannot be determined. (2) The effect of the calibration uncertainties on the GPS-measurements cannot be derived from such comparisons. Analysis on the accuracy of the laboratory calibration procedure of the university of Bonn, which are based on direct comparisons of different procedures, were published e.g. by Zeimetz and Kuhlmann 2006 or Zeimetz et al. 2009. To determine the accuracy of calibration by measurements at a test site, a reference solution is necessary. But, instead of being dependent on GPS, other systems (EDM, precise levelling) can be used as reference. The disadvantage is, that the estimated GPS accuracy is not equal to the calibration accuracy, because of additional uncertainties (e.g. multipath, near-field, tropos-phere). But it becomes obvious, which GPS accuracy can be achieved, when using these calibration patterns and especially when different antenna types are combined. Then, in some cases, the effects of multipath or near-field variations can be quantified, what leads to a more precise statement about the calibration accuracy (as in case of the near-field, chapter 5). As relative GPS is used, it is necessary to have a look at both involved setups. Because of the high degree of effort only three antenna types could be considered until now. Perhaps it is possible to complement these antennas, which are most prevalent in GPS networks, by further tests in the future. The EDM calibration baseline site (facility of the University of the German Federal Armed Forces) consists of 8 pillars. The distances between the 8 pillars vary from 18 to 1101 meters. The height differences between the top of all pillars are less then 30 mm. Each of the pillars has a height of approximately 1.6 m and all pillars are of the same type, whereas for the mounting of the antenna two different setups were used (see Fig. 4). The conditions are very good for precise GNSS-Measurements. The pillars are placed on an earth mound, thus the top of the pillars are between 3 and 4 meters above the surrounding surface level. The fence, visible on the left photo, should produce only short-periodic multipath effects because of the large (vertical and horizontal) distance between the fence and the antennas (e.g. Bilich et al. 2007). In case of such short-periodic multipath effects and an observation time of several hours, only weak multipath effects are expected. As the surface of the mound is uneven and not hard-surfaced, the mound itself should also produce only weak multipath signals. Significant ionospheric and tropospheric effects on the GPS results could not be excluded, even in case of short baselines (e.g. Santerre 1991). However, these effects should be very small and depend on the distance between the pillars, thus, these effects would become visible as systematic differences (depending on the distance). Anticipating the analyses, such effects could not be detected, thus, they can be neglected in the current state of accuracy. In order to increase the number of different antenna configurations, the observation time has been reduced to a duration between 4 and 10 hours. Especially for the determination of the height, longer observation times are generally used. These observation times were sufficient here, as shown in chapter 5. For the validation of the GPS measurements, terrestrial reference measurements can be used. The pillar heights have been measured by precise levelling and the distances between the pillars have been determined by EDM measurements. The accuracy of the EDM is limited primarily by atmospheric effects. Despite the measurement of temperature, pressure and humidity a scale error of about 1 – 2 ppm has to be expected due to mismodeling the effect of atmosphere. Considering the accuracy of the EDM (Leica TPS 1201+; 1mm + 1.7ppm) the total accuracy is between 1 and 3 mm depending on the distance, thus the EDM accuracy is comparable with the GPS accuracy. As the EDM measurements serve for independent results, they can be used for the detection of outliers. The height differences between neighboured pillars are measured twice by precise double-levelling. The differences between both solutions are smaller than 0,2 - 0.3 mm. Only in case of the baseline between pillars 7 and 8 the deviation is larger (0.4 mm). The antenna heights (heights above the pillars) are measured by levelling, too. Here an accuracy of 0.1 0.2 mm can be assumed. When comparing GPS and levelling results, it is necessary to become aware of the different reference levels. The GPS results are related to the used reference ellipsoid (here: GRS80), whereas the levelling depends on the local gravity field. Comparing GPS and levelling, the angle between the ellipsoid normal and the local vertical and the resulting effect on the height determination has to be considered (Flury et al. 2009). For the area of the Federal Republic of Germany the quasigeoid GCG05 (German Combined QuasiGeoid 2005) enables the conversion between ellipsoidal heights (ETRS89) and normal heights (DHHN92). The calculated quasigeoid heights increase from 45.610 m (pillar 8) to 45.636 m (pillar 1). As the normal of the quasigeoid and the direction of the local gravity field do not coincide, remaining relevant deviations are possible. 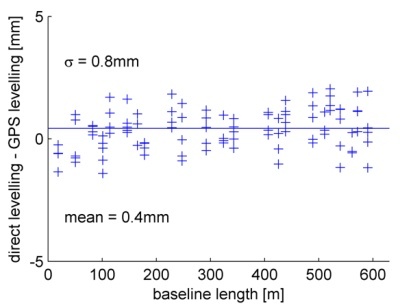 Such height differences would increase with the distance between two pillars (because of the tilt angle between the surfaces), however, such systematic effects are not visible in the results (Fig. 6). The campaign consists of 5 sessions. In the first session only 5 pillars could be used, whereas in the other session all 8 pillars were equipped with GPS antennas. Thus, 32 independent baselines were observed. Additionally 90 baselines can be created using the same observations (satellite signals). To have a look at all solutions is quite meaningful. Thereby the effect of the antennas and especially of antenna combinations can be analyzed. Correlations between the observations due to using the same signals are not relevant here. It is rather an advantage when station independent effects are correlated (e.g. correlations from atmospheric effects, orbit erros or the satellite geometry), thus station dependend effects become more significant. To get a first impression about the quality of the measurements, the differences between the precise levelling (geoid corrections are considered as described above) and the GPS-measurements are visualized in Fig. 5 (L1, 10° elevation cut-off, without troposphere parameter estimation), where the sorting of the baselines is random. The maximum deviations are less than 2 mm and the corresponding standard deviation is 0.8 mm. The distribution of the results is very similar to the theoretical Gaussian Distribution (see histogram, Fig. 5). The determined offset of 0.4 mm is significant. The cause is yet unknown, but a few possibilities could be excluded. Fig. 6 shows the same results as Fig. 5, but the sorting is different (displayed are all baselines < 630 m i.e. more than 90% of the results). Because there are no effects which depend on the baseline length, ionospheric effects, tropospheric effects and effects of the different reference levels (ellipsoid vs. geoid) can be discarded. Antenna effects are possible, but because of antenna swaps the mean should be zero or at least not significant. Altogether, the L1-GPS solutions are quite good, especially as there are also uncertainties from the levelling (see chapter 4.2). In case of relative height determination with GPS, this high accuracy is possible if besides multipath and near-field effects also the antenna effects can be reduced to a very low level. This is especially important when baselines with mixed antennas are analysed, too. For the sake of completeness, it should be mentioned that the results of one station (session 5, pillar 8, à 7 baselines) were eliminated. The deviations are, independent from the choice of the second GPS-point, five times larger than the calculated standard deviation. Thus, these solutions are eliminated as outliers. One possible explanation is that the observation time is very short here (4 hours). However, the fact that the differences between the L1- and the L2-solutions are only around 2 mm contradicts this theory. Another possible explanation is that the antenna height was not measured correctly, but this cannot be clarified afterwards. Even, because of these results, it is important to check whether an increase of time causes a significant higher accuracy. Therefore in Fig. 5 results are displayed in red, when the observation time is between 4 and 5.5 hours. As the distribution of the red samples is very similar to that of the other results (blue = 5.5 – 10 hours), the observation time of at least 4 hours is suitable in this case. The standard deviation of the red samples is 0.8 mm as well. In the next step the L2-solutions are analysed (Fig. 7). The offset of 0.5 mm is equal to the "L1-offset" of 0.4 mm in a statistical sense. More important is that the standard deviation is twice as large as in case of L1. A lower accuracy for L2 is typical, but the ratio between sL1 and sL2 is too large. Systematic effects cannot be seen in the results, but the histogram shows some deviations from the theoretical form (red line). This is not unusual for GPS-measurements, but regarding the ionospheric free linear combination L0 these deviations become more obvious (histogram, Fig. 8). A lot of measurements (57) have a deviation of only ±1mm in comparison to the levelling. On the one hand the histogram shows that the calculated value for the standard deviation is too high for these samples. On the other hand there are too many deviations which could not be explained by random noise. Since the L1 solutions do not show such systematic effects, there has to be an effect, which affects L1 and L2 in a different way. It is common knowledge that the near-field of the antenna changes the behaviour of the electromagnetic field of the antenna and as a consequence the phase measurement of the antenna (see Wübbena et al. 2006). In case of the presented GPS-measurements, 3 antenna types and 2 different setups were used. By combining different antenna types and different antenna near-fields (mounting) it is here possible to detect near-field effects and ensure that no other effects (e.g. multipath, ionosphere) cause the problems which are visible for L2. In Fig. 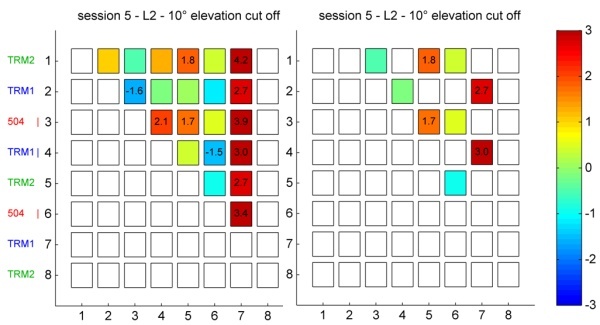 9 (left) the differences between GPS and the precise levelling are visualized in a grid (session2, L2, 10° elevation cut off). 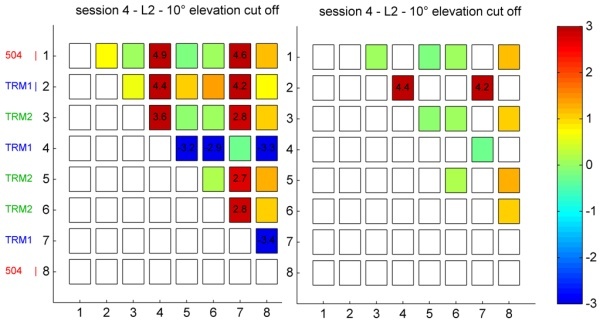 This grid shows the difference between GPS and levelling heights. In case of the baseline between the pillars 1 and 2 (first box, top, left) the difference is e.g. 2.2 mm. The exact value is displayed if a limit of 1.5 mm is exceeded. If the value is smaller, the difference is depicted only in form of the color coding. This representation was chosen to highlight the relevant values. Additionally the left axis is labeled with the corresponding antenna types. Obviously, the largest differences appear if one TRM1 antenna is involved. In these cases, the signs and the amplitudes of the differences are similar (regard the direction: Dh12 = - Dh21). The mean value of these differences is 2.6 mm. When using two TRM1 antennas, the limit will not be exceeded, because similar systematic effects are eliminated in case of relative GPS (baselines 2-3, 2-7, 3-7). In the right figure all combinations with one TRM1 antenna are faded out, what facilitates the comparisons. All deviations are smaller than 1.5 mm. In session 4 one major change has been applied w.r.t. session 2, i.e. the antennas at the pillars 1, 2 and 8 have been equipped with a 255 mm distance piece (Fig. 4 left). In Fig. 10 this is marked by the vertical line in the antenna type name (e.g. “TRM1 |”). As a consequence, the modified TRM1 antenna at point 2 does not show the same (abnormal) behaviour as the ones at point 4 and 7 (mounted as shown in Fig. 4; right). The latter ones behave as in session 2 (Fig. 9). Thus, the changed near field produces a deviation of around 4 mm (Fig. 10; right). Furthermore, the setup with the distance piece shows a good (better) agreement with the levelling. In addition it is obvious that only the TRM1 antennas show such strong near-field effects. Whereas in case of the Choke Ring antenna (504) this can be explained by the better shielding, the behaviour of the TRM2 antenna, which outwardly looks like a TRM1 antenna, was not expected. - Changed environments (e.g. changing multipath environment because of rainfall). The size of the detected near-field effects becomes clear if the results of all sessions are visualized in one figure (Fig. 12). The sorting of the baselines is again random. The baselines where exactly one TRM1 (without distance piece) antenna was used, are displayed in red. If two TRM1 were used, the results are colored in green. The red samples spread around +2.5 mm and –2.5 mm. Altogether, the blue and green ones show a better agreement with the results from the precise levelling. 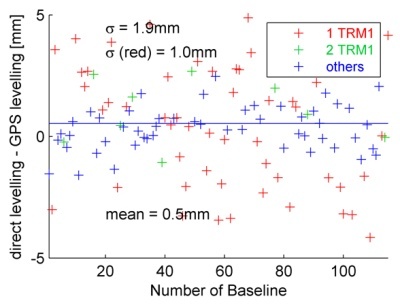 The standard deviation of the reduced sample (blue & green samples; “TRM1 |” setups are included) is sL2,red = 1 mm and very similar to the L1 solutions. (sL1= 0.8 mm, see Fig. 5). Of course the L0 results show the same systematics (Fig. 13). For the sake of completeness: for the L1 solutions such effects are not visible as expected because of the results displayed in Fig. 5. As presented above, the reason for the great deviations in case of L2 is the effect of the near-field, when using the antenna-mounting combination displayed in Fig. 4 (right). But it is useful to discuss, whether other effects could play a contributory role, too. multipath: Improbably because multipath effects are site-dependent and the here discussed effects are visible for one special antenna-mounting-combination and not only at special pillars. antenna calibration: In case of calibration there are near-field effects as in the case of GPS-measurements. A separation of the antenna-field and the near-field is not possible as mentioned above. Other systematic effects of the calibration should be similar for all antennas, thus the effects are eliminated in case of relative GPS. atmospheric effects and satellite orbit error: These effects depend on the baseline length, but they are independent from the receiver antenna. The visible effects are independent of the baseline length. Finally, it has to be noted that in the here presented case a Trimble Zephyr Geodetic antenna reacts on changes in the near-field. This result is only valid for the tested antenna-mounting combination. It is possible that in other environments other antennas react sensitively. 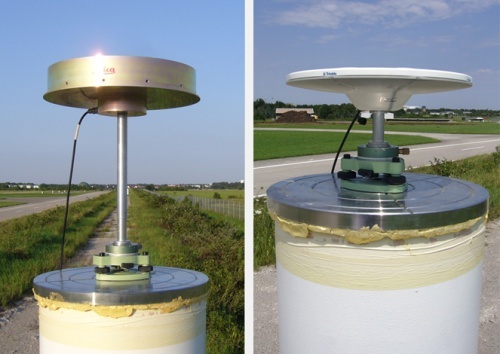 In order to review the validity of the absolute chamber antenna calibration procedure, GPS-height measurements are compared with the results of a precise levelling. Based on these measurements, an accuracy of around sHeight 1 mm could be proven (sL1=0.8 mm and sL2=1 mm). But it has to be remarked, that in case of one antenna-mounting-combination larger differences were found. These differences were caused by the near-field of the antenna and not by remaining uncertainties of the calibration. In cases without such strong near-field effects, the remaining uncertainty budget is composed mainly of multipath, near-field and tropospheric effects, the remaining uncertainties of the antenna calibration and of the precise levelling. As shown above, it is of secondary importance to obtain the exact amount of the calibration, as long as the near-field problem is not solved. Within the limits of the determined accuracy, the calibration is valid for at least the three tested antenna types. The general benefit of the antenna calibration in absolute terms has not been discussed in this paper. This has been done in earlier works on this topic (e.g. Menge 1998). More interesting is how good the agreement between the currently available calibration procedures is. As for each of the calibration procedures e.g. the mountings of the antennas and so the near-field effects are not equal, differences should become visible if the results of different calibration procedures will be mixed. It is interesting whether it is possible to mix the procedures without a reduction of accuracy. This should be answered by further investigations. The existing data set is well suitable for this task. In a first step, all 9 antennas have to be calibrated with alternative procedures (if possible with relative and absolute field procedure). Hopefully, the analyses with mixed calibrations leads to some new findings about the calibration accuracy and the near-field problem. Bilich, A., Larson, K. M., 2007, “Mapping the GPS multipath environment using the signal-to-noise ration (SNR), Radio Science, Vol. 42, No. 2, CI: RS6003. Flury, J., Gerlach, C., Hirt, C., Schirmer, U, 2009, “Heights in the Bavarian Alps: mutual validation of GPS, levelling, gravimetric and astrogeodetic quasigeoids”, Geodetic Reference Frames, IAG Symposia, Vol. 134, pp. 303-308, Munich. Geiger, A., 1988, „Einfluss und Bestimmung der Variabilität des Phasenzentrums von GPS-Antennen“, Mitteilungen des IGP der ETH-Zürich, No. 43, Zurich, Institut für Geodäsie und Photogrammetrie an der ETH-Zürich. Kraus, J.D., Marhefka, R.J., 2003, “Antennas: for all Applications”, third edition, McGraw Hill. Menge, F., 1998, „Zur Kalibrierung der Phasenzentrumsvariationen von GPS-Antennen für die hochpräzise Positionsbestimmung“, Wiss. Arb. d. Fachr. Verm., 247, University of Hanover. Santerre, R., 1991, “Impact of GPS Satellite Sky Distribution”, manuscripta geodaetica, Vol. 16, pp. 28-53. Schupler, B.R., Allshouse, R.L., Clark, T.A., 1994, “Signal Characteristics of GPS User Antennas”, Navigation, 41(3), pp. 277-295, Institute of Navigation. Wanninger, L., May, M., 2000, “Carrier Phase Multipath Calibration of GPS Reference Stations”, Proceedings of the 13th International Technical Meeting of the Satellite Division of the Institute of Navigation ION GPS 2000, Salt Lake City, Utah, USA. Wübbena, G., Schmitz, M., Boettcher, G., 2006, “Near-field Effects on GNSS Sites: Analysis using Absolute Robot Calibrations and Procedures to Determine Corrections”, Proceedings of IGS Workshop 2006 “Perspectives and Visions for 2010 and beyond”, Darmstadt, Germany. Zeimetz, P., Kuhlmann, H., 2006, “Systematic effects in absolute chamber calibration of GPS antennas”, Geomatica, 60/3, pp. 267-274, Ottawa, Canadian Institue of Geomatics. Zeimetz, P., Kuhlmann, H., 2008, “On the Accuracy of Absolute GNSS Antenna Calibration and the Conception of a New Anechoic Chamber”. Proceedings of the FIG Working Week 2008, 14.-19. June, Stockholm, Sweden. Zeimetz, P., Kuhlmann, H., Wanninger, L., Frevert, V., Schön, S., Strauch, K., 2009, Ringversuch 2009, 7. GNSS-Antennenworkshop, 19.-20. March 2009, Dresden, Germany. Mr. Philipp Zeimetz holds a diploma degree in geodesy from the University of Bonn, Germany. He is a scientific assistant at the Institute of Geodesy and Geoinformation of the University of Bonn. His research is mainly focussed on the calibration of GPS-antennas. Prof. Dr. Heiner Kuhlmann is full professor at the Institute of Geodesy and Geoinformation of the University of Bonn. He has worked extensively in engineering surveying, measurement techniques and calibration of geodetic instruments.